(Nanowerk Spotlight) Graphene is undoubtedly emerging as one of the most promising nanomaterials because of its unique combination of superb properties, which opens a way for its exploitation in a wide spectrum of applications ranging from nanoelectronics to optics, sensors, and biodevices (read more about graphene properties, uses and applications). To exploit these opportunities, and to get graphene-based devices and applications into the marketplace, this material has to be available on an industrial scale, e.g., in wafer-sizes 5 inch and up. That is why, for instance, the European Union's recently launched 10-year graphene flagship project has a dedicated work package focused on production (see also: Graphene: The quest for supercarbon, detailing some of the fundamental problems facing the commercialization of graphene applications). Over the past few years, researchers have developed numerous methods for synthesizing graphene. 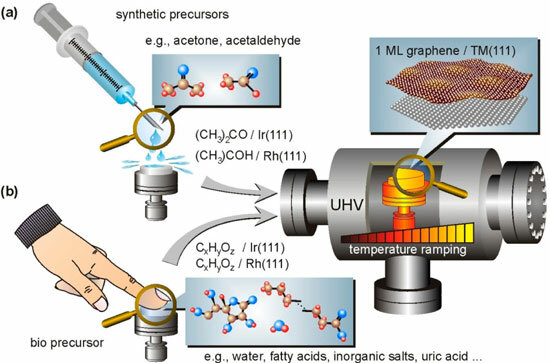 The synthesis of high-quality graphene is usually prepared by a complex and costly process – epitaxial growth on transition metal surfaces via chemical vapor deposition (CVD) using high-purity hydrocarbons as precursors. "However, this kind of synthesis is in conflict with one of the desired applications – transistor arrays – since a metal support short cuts the graphene layer," Dr. Frank Müller, a researcher in the Condensed Matter Physics group of the Department of Experimental Physics at the University of Saarland, tells Nanowerk. "To date, however, the presence of a metal surface is a basic requirement for the CVD synthesis of graphene because its catalytic effect is necessary for the process." Müller explains that one way to circumvent the problem is to firstly grow graphene on a thin metal film laying on an insulating surface. Secondly, the metal film is removed by chemical etching. That way, the graphene layer gets in direct contact to the insulator. Etching, however, introduces a new challenge, since it can induce defects in the graphene layer and can spoil its unique electronic properties. "The challenge to be overcome can be reduced by use of metals with very small chemical interaction with the graphene layer," notes Müller. "Unfortunately, on some of these metals – such as silver – the performance of carbon uptake during a CVD process decreases with decreasing interaction. Therefore, we have used liquid precursor deposition (LPD) synthesis, which is an adequate alternative to CVD." In LPD, the precursor molecules are provided via the liquid phase, e.g. by rinsing the metal surface with an organic solvent. In this process, weakly interacting metals take enough carbon from the precursor molecules to ensure graphene growth. In a new study, published online in Langmuir ("Graphene from Fingerprints: Exhausting the Performance of Liquid Precursor Deposition"), Müller, who is first author of the paper, and his fellow researchers demonstrate the reliability of graphene growth by LPD using an unconventional liquid – a human fingerprint. Müller concedes that, on first sight, graphene formation by a fingerprint may seem like a useless experiment. "Nobody would seriously consider the application of this synthesis route in a technological production step. However, our experiments prove the reliability of LPD synthesis because graphene growth from fingerprints, although starting with a highly uncontrolled way to deposit carbon, achieves the same results as the LPD synthesis route using pure synthetic precursors." In all experiments by the University of Saarland team, LPD synthesis by using synthetic precursors and by using fingerprints provided the same results in terms of graphene monolayer formation. The precursors just affect the initial amount of material that is provided after deposition. "Since the fingerprint contains a broad mixture of different chemicals, its excellent performance for graphene formation is an interesting result in terms of suitable or unsuitable precursor," Müller points out. "Our experiments show that graphene does not only grow from organic 'waste' but also self assembles directly out of the 'waste', showing that the synthesis of monolayer graphene on transition metals is an extremely robust process." LPD may give access to a wider range of substrate materials for graphene growth. The results from this study may contribute to a possible future synthesis route for graphene on insulators, thereby disposing all the problems in handling the current transfer techniques. Future research on graphene will focus on sandwich structures that combine several layers of 2D materials, i.e. the so-called van der Waals heterostructures. They form a new class of materials with tunable electronic and mechanical properties.